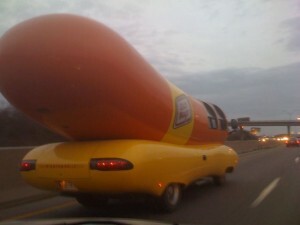 A couple days ago, I was on my way south on I-35 in Lewisville, Texas and as I ramped onto the freeway, out of my peripheral vision, the Wienermobile screamed past traffic in the left lane. Though it had a head start, I was not about to let this wiener get away. At the cheering of my family, we raced through traffic, darted between cars, hauled the mail and eventually caught up to the fiberglass hot dog on wheels to get a few pictures and a wave. Sure, we missed our exit in pursuit of the sausage, but it was well worth it. Just hearing my son yell “you can do it, Daddy!” was enough for me. And let it be said for the record, this account was for drama only, both the hotdogger and I had complete control of our vehicles (wiener?) at all times and the Texas traffic laws were obeyed.